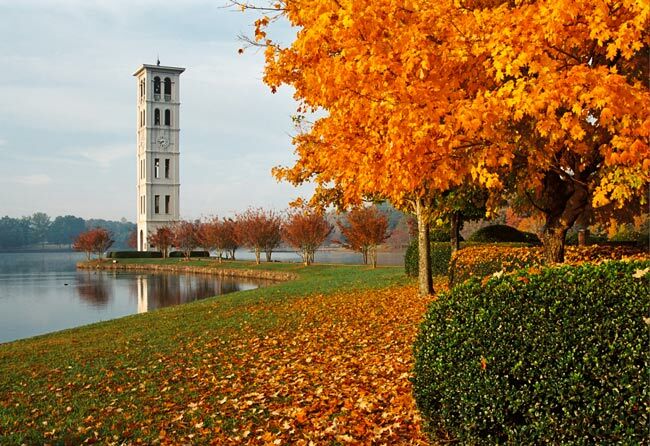 This Florentine bell tower is one of Furman University’s most beloved landmarks. 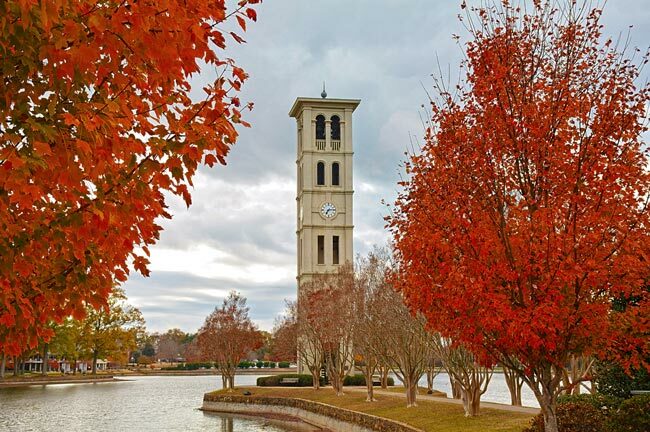 Furman’s original bell tower was built in 1854 on what used to be the men’s campus in Downtown Greenville. The bells rang to signal the start of classes and to celebrate victories for the athletic teams. 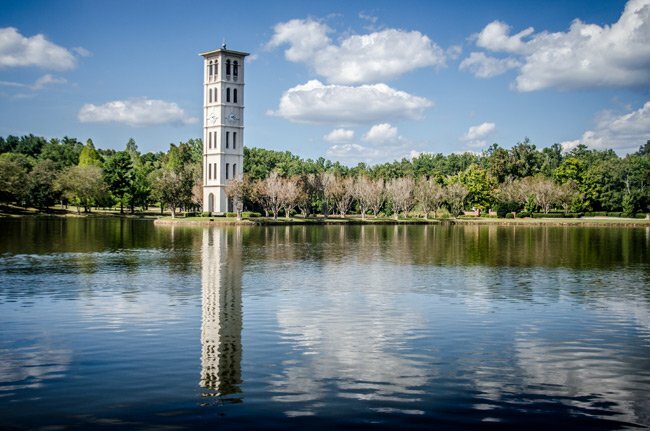 Classes at Furman were disbanded during the Civil War, but the bells in the tower were rung to announce Confederate victories. 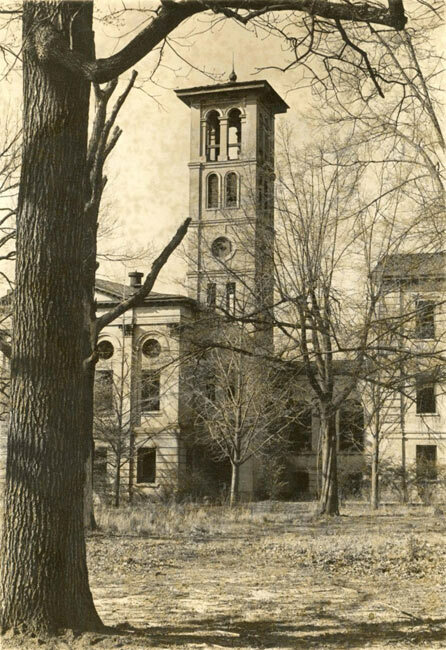 The original bell tower was not freestanding but connected to “Old Main” or, as it later became known, Richard Furman Hall. It was designed by Edward C. Jones of Jones and Lee, a prominent architectural firm in Charleston that also designed many other buildings such as Old Main at Wofford in Spartanburg, the Church of the Holy Cross in Stateburg, much of Magnolia Cemetery in Charleston, and several other churches and buildings in Charleston (1). The new bell tower, dedicated in May of 1965, was built to the same specifications as the old tower. It bears a plaque at its base honoring Alester Garden Furman, grandson of Furman’s first president, James Clement Furman. 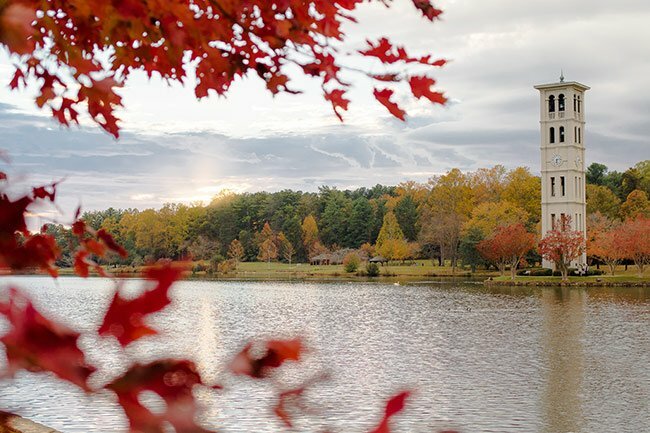 The younger Furman graduated in 1914 and became a major financial donor to the college. 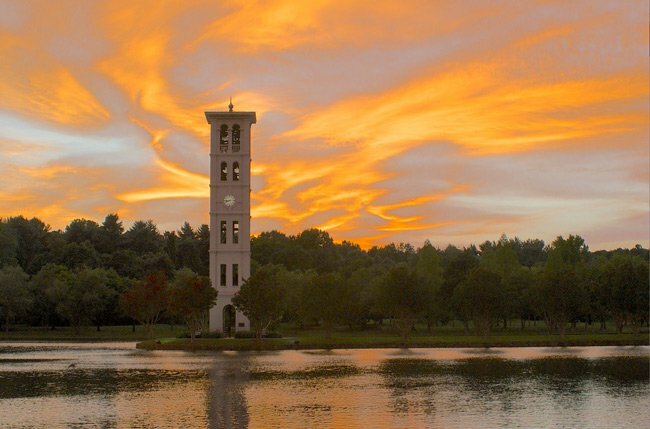 Fifteen months later, the tower’s 60-bell carillon was named for John Edward Burnside, a 1917 graduate and successful financier. The bells were custom cast in Holland. 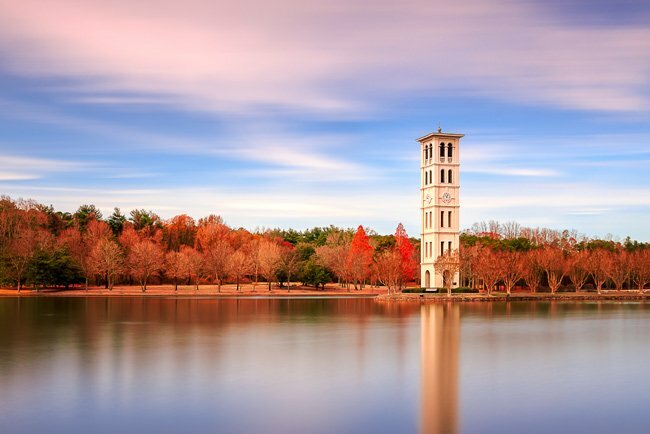 Unlike its predecessor, today’s tower stands alone on a small peninsula in Furman Lake. 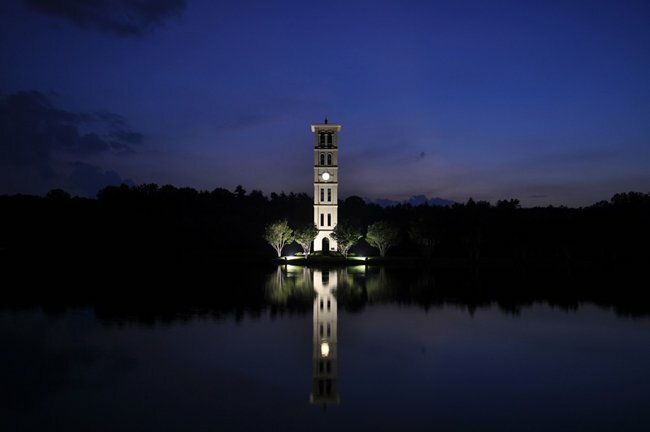 Linking the past with the future, it represents Furman for students and alumni alike. Its iconic image appears on the school’s seal and on many of the university publications. Last but not least, an interesting legend surrounds the bell tower. It is said that if a man and woman kiss while inside it, they will marry. See comments from readers below for first-hand anecdotal evidence of the legend’s truth! 1. 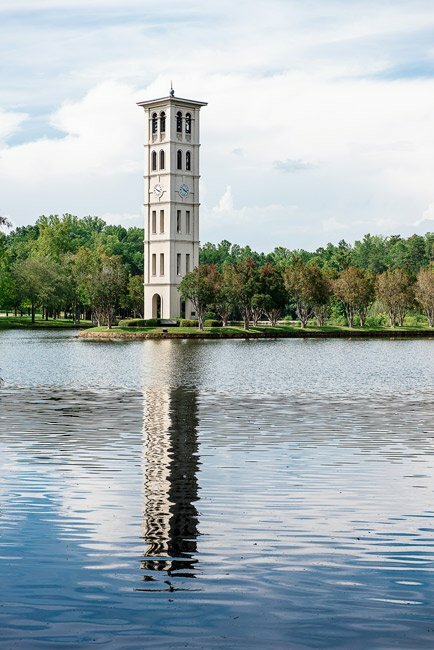 Many, many thanks to Tom Taylor of Greenville, not only for contributing his beautiful images of the bell tower, but also for telling us more about the tower’s origins. Tom is a graduate of Furman, and his wife is the head of the Chemistry department! Yes, you can! It is gorgeous. Are you allowed to take photos In and around the tower? I am a photographer looking for a beautiful places such as this for an up coming engagement shoot. Thank you for these great details, Tom! 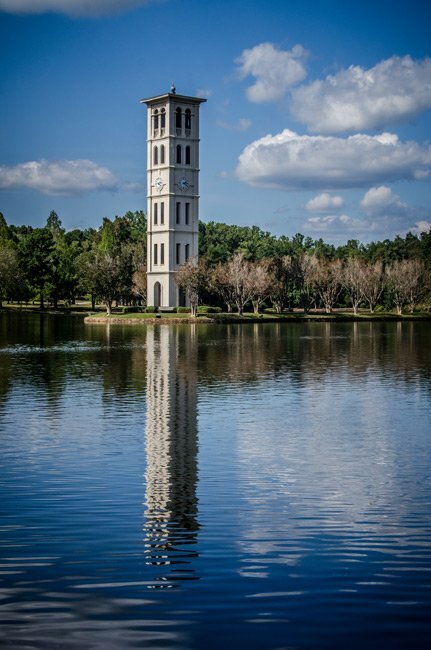 The original Belltower was designed by Edward C. Jones, prominent architect from Charleston that designed many other buildings such as Old Main on the Wofford College campus in Spartanbug, the Church of the Holy Cross in Stateburg, much of Magnolia Cemetery in Charleston, and several other churches and buildings in Charleston. I have many memories of this Belltower from when I was a student there. One of my good friends was the carillon play. I got to play the bells a couple of times. I also rappelled down the side of the Belltower from the top (clandestinely, late one night.) When we had a Frisbee break, we would give it a “burial at sea” by launching it into the lake from the upper floors of the tower (an environmentally unfriendly act that we would never do now.) Sadly, the upper floors are no longer accessible to the public. I’m hoping our college pranks had nothing to do with that. Hello, Franci! The photos are indeed stunning! We refer people to the photographers themselves regarding inquiries about photo use, as they are the owners of the images and generously share them with us for the SC Picture Project. Most of the images have a link to the photographers’ websites. However, if you can’t find a way to get in touch with a photographer, let us know and we will try to get you an email address. Best of luck! 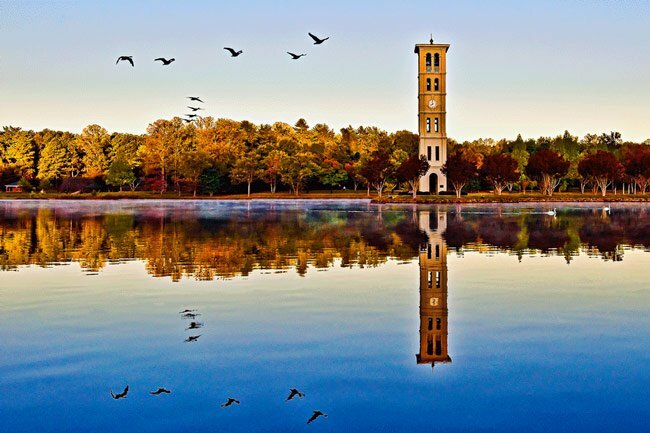 May we use the images on the Spartanburg CVB FB page to promote these landmarks in Spartanburg County? They are absolutely stunning. What a thoughtful project. Do the tower bells ring at a set time or only for special occasions? Thanks. Where can one get a detailed drawing of the tower with its dimensions? How tall is it and how wide is it and other stats on the tower?